Airbrush Body Painter Russ Van Ness will at ConFusion offering makeup and bodypainting for costumes for a reasonable fee (negotiable depending on the complexity of the desired makeup). Russ uses a water based body makeup for easy removal that is also easy on the skin. 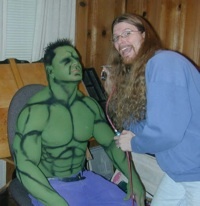 He uses hand painted techniques to enhance the airbrush effects that he lays down on the skin. Russ will be doing a Demo at 7 pm Friday in Salon H, so come be a volunteer subject and see what the excitement is all about. He will also be available during the GoH Reception and throughout both Friday and Saturday evening in Salon H.
We try to make it possible for even the money-crunched to attend ConFusion in a number of ways. Food — There will be food (mostly snack-type food, but some more substantial stuff) and drinks in the consuite 24 hours a day during the con. There will also be a very affordable lunch-time concession in the main lobby Saturday and Sunday. There is a restaurant onsite that is fairly expensive (cheaper entrees can be found out in the bar in the lobby area), but guests of the hotel can take advantage of the hotel shuttle to get to any of the many restaurants within 5 miles. A restaurant guide will be available at the registration desk. Also, every hour you volunteer earns you a "gopher buck" that can be spent in the dealer's room or for lunch in the lobby. Crash space for Volunteers — one of the perks of being a gopher is you can use the Gopher Hole. We have separate rooms for guys and girls, accessible for registered volunteers who are volunteering for at least 6 hours – go see the volunteers head when the Volunteers desk is open and Ops when it is not. Earn your Registration Back — Volunteer enough and your membership will be reimbursed on Sunday. Also, there are prizes. Go see the Volunteers head at the desk across from Registration. The schedules and the program book are now online! Woo-hoo! We will be having a food drive this year, so please bring canned goods and other non-perishable food items to the registration desk with you to donate. All donations will go to the Gleaners Community Food Bank in Pontiac. Who Will Be The 2009 ConFusion Princess? Cast your ballot at the registration desk. Voting ends Saturday at 10:00 pm. Vote for the hardest-working volunteer, the most famous pro, the biggest fan ... or just vote for that guy you want to see in a tiara! "Do we look like we need rescuing?" 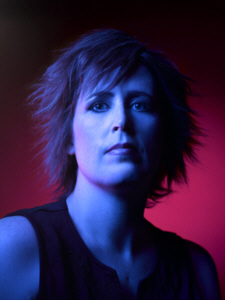 NYT-bestselling author Kelley Armstrong will be attending Cryptic ConFusion as a special guest sponsored by Subterranean Press! Kelley Armstrong is a New York Times-bestselling author based in Ontario, Canada. She has published over a dozen novels, most set in her Women of the Otherworld series. After graduating with a degree in psychology, she switched gears and studied computer programming. Soon after the publication of her debut novel Bitten, she turned full-time to writing and parenting. Her upcoming book, Men of the Otherworld, which collects many of her previous online novellas and short stories, will be released at the end of January 2009, as well as her short story "Zen and the Art of Vampirism" in A Fantasy Medley in March 2009. 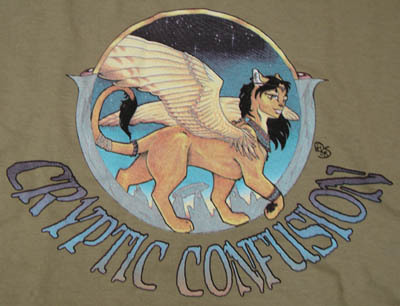 The runner-up in the contest to volunteer the most hours gets a free ConFusion shirt! (First place prize is a $25 gas card). Masquerade registration will now be done at the con instead of needing to pre-register. See the details on the Masquerade page. Thinking of volunteering? Thinking you might be the one to go the extra mile and earn the coveted Volunteer of the Con award? Here's some more incentive: In addition to all the other perks of volunteering the Volunteer of the Con will receive a free membership to the 2010 ConFusion and a $25 gas card. Worried that you might put in all that work only have someone just beat you out for the prize? Never fear! There's a free con t-shirt in it for the Volunteer of the Con runner-up. ConFusion adds Cryptic Guest of Honor: Cory Doctorow! I am pleased to report that Cory Doctorow has accepted an invitation to be Cryptic ConFusion's Cryptic Guest of Honor! I'm sure many people remember what a fabulous guest Cory was at Penguicon a few years ago. This year the AASFA board has introduced a tradition of letting the Chair define a special GoH category each year, and I chose to seek a guest who compliments our Cryptic ConFusion theme. Cory's latest work, Little Brother, is filled with crypto, games (ARGs and LARPs and more! ), and puzzles. Plus Cory has long worked to defend the rights of the online community to defend their own privacy with tools such as cryptography. Here is the second installment of the Cryptic Crossword! 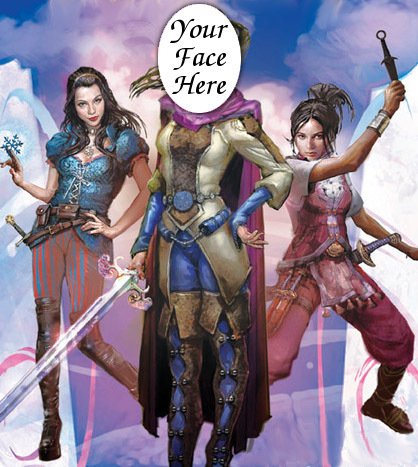 Cryptic Confusion is looking for folks to run games! See the gaming page for more info.